Ministry of Railway has announced the latest jobs 2019 in Railway Department for filling the vacant position. Ministry of Defence invite the application allover the country. The candidates who have domicile of any province are eligible for such post. For the purpose Ministry of defence handover the Open Testing Service to announce the advertisement, receive application form eligible candidates conduct the written test and give the selected candidate list. The individual who want to apply for Ministry of Defence they can download application form on this page for Assistants, Steno typists and Upper Division Clerk. Open Testing Service OTS receive the application Review the application and announced the roll number slips. The applicants who are eligible for written test of Railway Jobs 2019 can also download roll number slips form here. Also here we provide the answer key of written test and results of candidates who appear in the written test when the Open Testing Service officially announced. The candidates who appear in the test and pass the written test they can also checked final merit list on this page. Stay in touch with us and keep visiting our site for further updates. 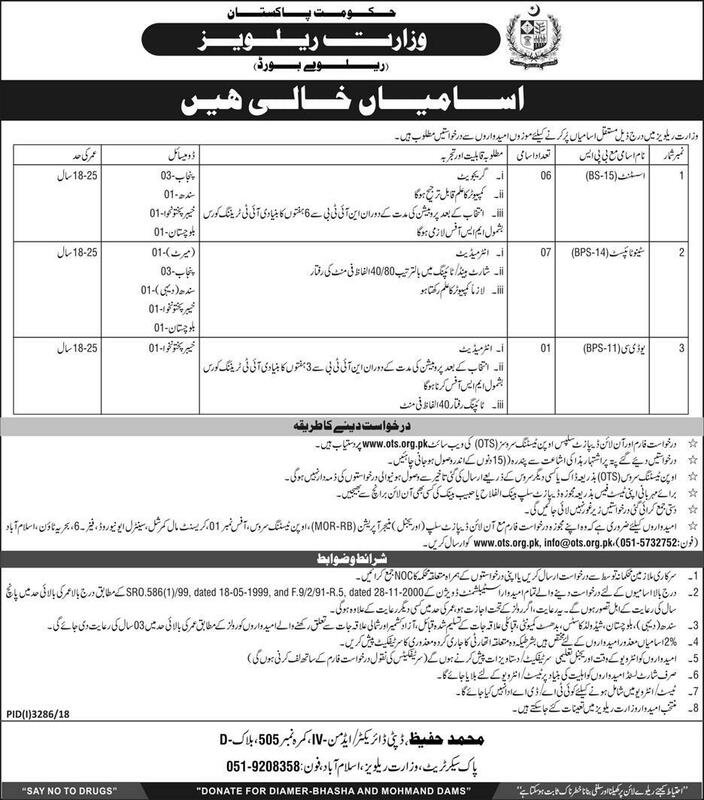 all the information of Pakistan Railways Jobs 2019 provided here. Application forms and online deposit slips are available on OTS Official web site and Gotest.pk. Application must be received at the given address not later than fifteen days of the publication of the advertisement. Open testing serivee will not be responsible for late receipt of application sent through post or by any other service. Please submit your test fee through prescribed deposit slip on any online branch of Bank Alfalah and Habib Bank. Government employees shall apply through proper channel or submit the NOC from concerned department along with their applications. Relaxation in upper age limit will be admissible for 3 years as per rules to candidates belonging to Sindh, Balchistan, Scheduled Caster, Buddhist Community, Recognized Tribes of Tribal Areas Azad Kashmir and Northern Areas. 2% posts are reserved for disabled candidates subject to production of disability certificate issued from concerned authority. Only short listed candidates on the basis of eligibility will be called for test/interview. The selected candidates can be posted at Ministry of Railway.